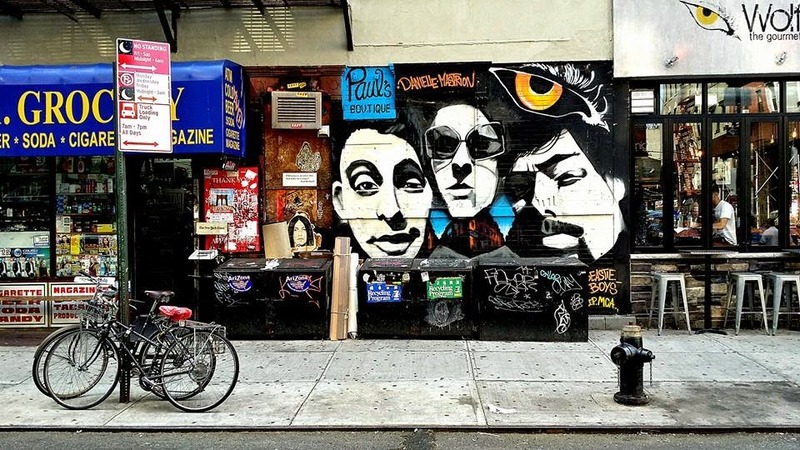 This Beastie Boys mural went up this weekend on Ludlow and Rivington. 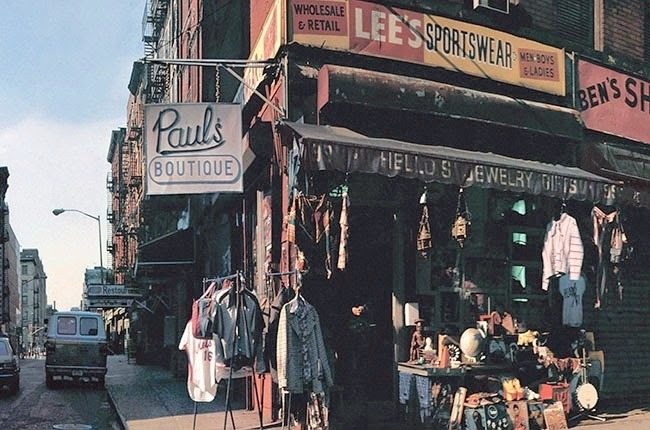 As you may have read, the mural is in honor of their second record, "Paul's Boutique," which is celebrating its 25th (!!!) anniversary. 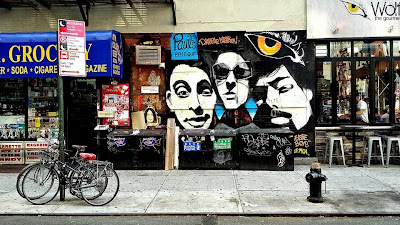 Brooklyn-based artist Danielle Mastrion created the mural outside Wolfnights, the sandwich shop on this corner. LeRoy McCarthy, who unsuccessfully lobbied for "Beastie Boys Square" here, is also behind this project. The storefront was once home to Lee's Sportswear, which appeared on the cover of "Paul's Boutique." Thanks to EVG Facebook friend Shirley Dluginski for the new mural photo! There are New Yorkers who have made a far greater impact on the city than them but don't have anything named after them, besides that a park in Brooklyn is named after the late Beastie Boy Adam Yauch, Adam Yauch Park. This city can't honor a band member AND his band. These guys were not pioneers of rap or music. Of white people doing rap, yes, of course they were the first white rappers but so what? The band itself would tell you that themselves. That's the legacy of Beastie Boys: great rappers who happened to be white when most rappers were black. Nice work, but why did she have to paint her name so large and direct? Jesus, it ain't about you, girl! And yes I agree that street should definitely not be in their name, but great to at least have some sort of tribute. I would argue that the Beastie Boys were pioneers of both rap and music – and one of the most important NYC musical groups in history.